I installed Windows 8 in my System. During installation I made 4 Partitions as ‘C’, ‘D’, ‘E’ and ‘F’. From 3 days, I am unable to see the Partition E. I have some important data in ‘E’ Partition. Please, anyone help me in Solving the Problem. Then Click on Disk management..
See which one not visible.. and Right click on that..
Click on New simple Volume..
Then follow instructions.. it shows..
Might be that drive had become invisible. Don't worry just right click on my computer and select manage. Now select disk management from the available options. Select the volume which is not visible to you and right click on it and select new volume. Next follow the steps it shows and then a new drive will be created. Now you can use Easyrecovery tool to recover your data. =======>Right Click on My computer. =======>After clicking Computer Management window will open. =======>Now you will see the all the disk drive present in your system as in list. =======>Now go to Action part. =======>Select the View option and click on Settings. =======>Click on Scaling under the setting window. =======>Check the radio button says All as the same size under the Display disks. 3.) # Methode-3 Launch Disk-Management via key [Win-Logo]+[X]!
) # Methode-1 Open the Disk-Management in Windows 8 with key [Win-Logo]+[R]! 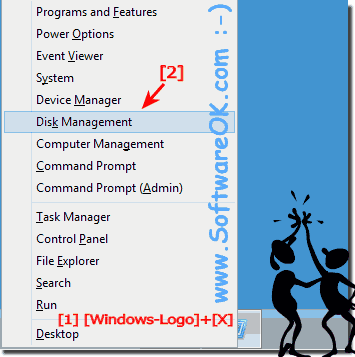 Start "RUN" in Windows-8 with keys [Win-Logo]+[R] and type in »(Edit-Box) "diskmgmt.msc" and press [ENTER] to open the Disk-Management in Windows-8.